Vogel, Kenneth Louis Joseph, passed away Sunday, March 31, 2019, in Denver, Colorado. He was 97. He was preceded in death by his wife of 67 years, Georgia Marie (Krejci) Vogel. Ken was the beloved father of Kenneth A. (Joyce) Vogel, Janice (Gerald) Paul and Scott Vogel; dear grandfather of Joshua and Drew Vogel, Christopher Paul and Alison Paul Bauer; great-grandfather to Lena, Samantha, Jacob, Rio and Ace; brother to the late Esther Schuchardt and Everett, Floyd and Lester Vogel; uncle, cousin and friend. Ken was a proud graduate of McBride Catholic High School and attended Macalester College in St. Paul, Minnesota, and University College at Washington University. He served in the U.S. Air Force during World War II, and later served as deputy state commander of the American Veterans in Missouri. He moved to Sunset Hills in 1973 and got involved in municipal politics. 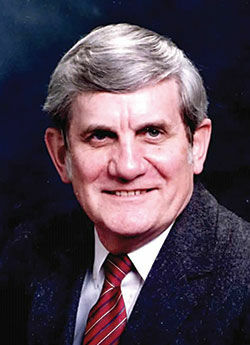 He served as alderman for 14 years before being elected mayor of Sunset Hills in 1992, serving for eight years. After his retirement, he was appointed to two city boards. He presided over the expansion of Sunset Hills through annexation, reconfiguration of the Plaza at Sunset Hills through eminent domain, and construction of the police station and government complex. He also was the owner-manager of Sappington Pharmacy from the late 1960s until 2000. After his retirement, he relished his time with his wife and their precious Maltese, Lucy, and he indulged his passion as a Cardinals baseball fan. Three years after being widowed, he reluctantly shed his roots as a lifelong Missourian to move with his daughter and son-in-law to Denver, Colorado, to help care for his great-granddaughter, Lena Paul. He never regretted the move, viewing every day with Lena as a gift. His family will miss his wisdom, his integrity, his expansive love and his humor. Services: Visitation is Monday, 4 to 8 p.m., at Kutis Affton, 10151 Gravois Road. Mass at 10 a.m. Tuesday at St. Catherine Laboure, 9740 Sappington Road. Interment will be private. In lieu of flowers, memorial contributions may be made to the Sunset Hills Foundation, c/o Sunset Hills City Hall.